I divided these into categories and themes so this can apply to any man in your life. Just click on an item picture or link to shop. Please feel free to contact me with any questions! Technology and techie gadgets are always a great gift option for anyone, but this was a category my hubby was extra excited about. Bluetooth headphones are a great gift for anyone who enjoys listening to music, podcasts, or videos wirelessly. These are especially convenient for those who workout. The question is: earbuds or on-ear headphones? These Jelly Comb USB ports are helpful to have both in the car and anywhere else people tend to charge their devices. Choose from the multi-port car charger and the 6 port desktop charger. Help him corral his devices with this bamboo charging station dock. Have a guy that likes to listen to his music out loud? Bluetooth speakers like this one are perfect for anywhere such as the garage, the kitchen, or for an outdoor party. Whether you are shopping for someone who has great fashion sense or no fashion sense at all, apparel is always a good gift option. Does your guy enjoy lounging and sleeping in pajamas? These pajama pants are a great option as well as this whole pajama set. Along with pajama pants are essential slippers. We bought some cozy slippers like these for my hubby for Christmas years ago and he still wears them every day! Cuff links are great for the guy who dresses up all the time or once in a while. This set comes with two pairs of links that go with any shirt or suit. Last year I surprised the man in my life with this watch display case. Clear on top so easy to see their arm candy, it keeps all of their beloved watches protected in one place. These leather money clip wallets are small, discreet, and are a convenient way for a guy to carry his cards and money. Whether or not your climate is super cold in the winter, a good pair of leather dress gloves is essential for any guy. Is the guy you’re shopping for more of a t-shirt or pullover sweater kind of guy? For the man who enjoys his fine wines and liquor or likes to entertain, these are all great gifts for any home bar. Moscow mules have been all the rage lately, and you cannot have one of those yummy drinks without the copper mugs! This set comes with 4 copper mugs plus copper straws, some coasters, and even a shot glass! There is something special about personalizing a gift for anyone, so why not personalize a flask or an old-fashioned glass? For Father’s Day this past year I surprised my husband with these Stella Artois Star Chalices for beer. Great quality and look nice too! If the man you are shopping for enjoys drinking bottled beer this beer bottle holder is what he needs! Insulated so keeps beverage cold and can also convert into a holder for cans. This 14-piece mixology kit has everything an at home bartender needs for entertaining including a shaker and recipes. These whisky stones set are great for anyone who enjoys a nice glass of whiskey but does not want it watered down by ice. Growing up my dad was always a coffee drinker, and now as an adult my mornings start with coffee for my husband and I. What guy doesn’t want to start the day with a coffee mug that says Handsome on it?! Or maybe his initial? I know my hubby always take a cup of coffee to go when leaving for work, this travel mug is perfect to keep coffee hot and fits in the cup holder of vehicles. A box of coffee and a mug? This is a yes please for me as well as for any coffee lover! If your coffee lover is a fan of french pressed coffee, these two gifts are spot on. Make it at home with this french pressed coffee maker, or on the go with a travel coffee press! Know a guy who loves the outdoors, camping, and a cup of joe? This camping coffee mug is perfect! These mugs combine coffee lovers and football fans! We bought my husband a single serve coffee maker for his desk at work last Christmas and it doubles as a tea and soup maker too! 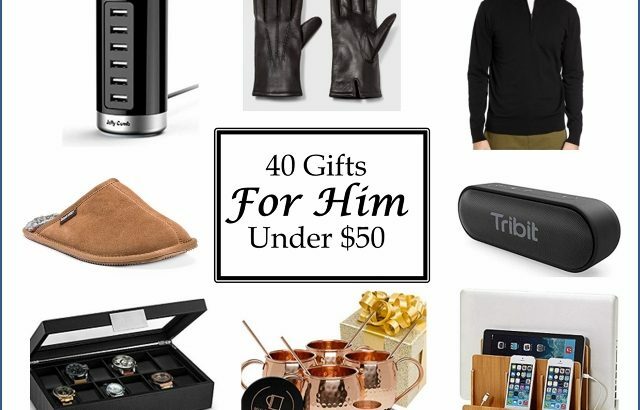 Here are some miscellaneous gifts that I loved but did not have a specific category for including some books and kitchen stuff. Any one of these make an amazing gift! Is grilling a skill your guy is trying to perfect? This book about grilling is a great place to start! Starting and ending each day on a positive note is so important and healthy for anyone, so why not give the gift of prayer? The book “One Minute Prayers for Men“could really make a difference in a man’s life. For the person who likes to work on projects that use power tools and screws, this is the perfect gift. This magnetic wristband holds small things like screws and bits on you while you work. I could’ve used this when building my outdoor sectional! Got a guy who enjoys cooking? An apron like this one is a great addition to anyone’s cooking or grilling accessories. A beard grooming kit such as this one is special for someone who takes pride in a well-groomed face and includes beard oil and trimming scissors. It is deer hunting season so for those guys (and ladies) who enjoy hunting and cooking their catch, the book “The MeatEater Fish and Game Cookbook” by Steven Rinella is an amazing resource for them! Everyone needs a toiletry set, and this one comes with a travel toiletry bag to store your body wash, deodorant, and more. Why not also add a bourbon flavored lip balm too? Got an NFL football fan who also likes to grill? This is a 4 piece set of grilling utensils that has your favorite NFL team’s emblem on it! Another great gift idea is a monthly subscription box such as the Dollar Shave Club and BirchBoxMan. With these your gift comes all year long! Hopefully you found a gift for all the guys on your Christmas list! Stay tuned for a holiday gift guide for her and for kids as well as a guide for stocking stuffers!